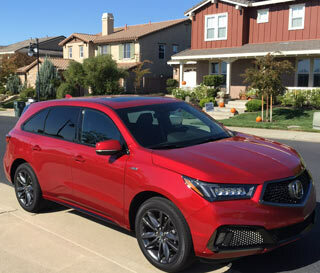 Roseville, CA- The stylish Acura MDX is quite a versatile, upscale sport utility vehicle. It can serve as a family-friendly vehicle that has three rows of seating and can haul up to seven people, providing appropriate transportation for kids and their many activities. But it can also be the cool SUV that one uses for the daily commute or the comfortable, classy mode of travel for a small family. A major redesign hasn’t taken place since 2015, yet the Acura MDX has aged well and remains one of the standouts in the luxury division of midsize crossover SUVs. The 2019 Acura MDX comes with some changes that aren’t that impactful. However, one significant addition is the A-Spec trim model, which starts at nearly $56,000, yet is worth consideration. This appearance package features a sportier exterior, 20-inch wheels, all-wheel drive, a cool-looking front grille, dark trim, and what Acura calls a blue pearl color. The Acura MDX has one very solid standard engine, a 3.5-liter, V6 that generates 290 horsepower and 267 pound-feet of torque. It travels 0-60 mph in 6.9 seconds. The engine is paired to a nine-speed automatic transmission that has standard front-wheel drive. Acura’s sophisticated Super Handling All-Wheel-Drive (SH-AWD) system is an option. The MDX can tow up to 3,500 pounds and that figures swells to 5,000 pounds with all-wheel drive. * Performance: 3.5-liter, V6, 290 horsepower * Mileage estimate range: 19-25 mph * Price: $45,400 to $60,200 * Warranty: 4 years/50,000 miles; drivetrain 6 years/70,000 miles; roadside assistance 4 years/50,000; corrosion 5 years/unlimited Although not reviewed here, there is an all-wheel drive MDX hybrid sport model with a 3.0-liter, V6 engine that produces 321 horsepower and 289 pound-feet of torque. Personally, a turbocharged option would also be a nice available option. Even without the Sport mode engaged, the MDX offers a very nice ride. It handles with ease in around-town driving and demonstrates its agility when challenged by an S-curve road or maneuvering in freeway traffic. In Sport mode, the MDX shows off a little more and does it with a pleasing engine roar. A smart interior characterizes the MDX. It has an appealing look with leather upholstery, quality material, and a sensible layout. The interior has both an upper and lower touchscreen that are somewhat intuitive in nature, but take some time to master. Android Auto and Apple CarPlay support is standard. Comfort is also a plus with the MDX, with the exception of the third row, which is better suited for a child, yet does provide easy access even for adults. Up front, there is considerable leg and head-room space. The second row could use a little more leg room. The third row eats up much of the cargo space (15 cubic-feet), but fold it down and that expands quite a bit (38 cubic-feet). One interior feature that’s not appreciated here is the gear selector. Instead of the standard shifter, the MDX has a push button selector that one utilizes to hit park, reverse, neutral and drive. While the driver will grow accustomed to it, the feature seems like an unnecessary departure from the norm. The 2019 Acura MDX provides solid value for the price. It has strong upside, delivering a fun SUV to drive that has good performance, strong handling, comfortable ride, and very few flaws.